Though pepper now nonchalantly graces virtually every dinner table, it was once so valued that the search for new pepper trade routes spurred the accidental exploration of the new world. Native to India’s Malabar coast, the once-precious pepper vine is now cultivated near the equator around the globe, from Thailand to tropical Africa to Brazil. Black pepper, our most ubiquitous spice, is the sun-dried version of the unripe green peppercorns popular in Thai cooking (white peppercorns are ripened and hulled versions of the same fruit). 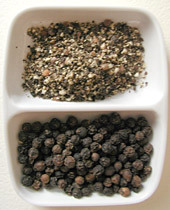 Tellicherry and the Lampong are considered the best varieties of black pepper. Black pepper’s rich, earthy aroma and mild heat make it at home in virtually any savory dish. Like salt, it has the added benefit of enhancing other flavors in a dish, making it especially useful. Black pepper is gaining popularity for its use in sweets as well, finding its way into fruit desserts, gingerbread, and the popular black pepper brownie. This entry was posted on Saturday, September 22nd, 2007 at 3:36 pm	and is filed under Encylopedia, Herbs & Spices. You can follow any responses to this entry through the RSS 2.0 feed. You can leave a response, or trackback from your own site.